Go forward in time to July 2013. 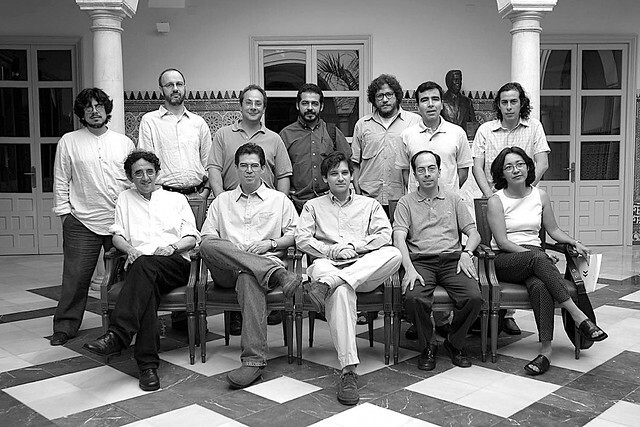 Ten years ago, on June, 25th 2003, 12 Latin-American writers gathered in the city of Seville to celebrate the first Encuentro de Escritores Latinoamericanos. Among them, one of the greatest writers of the late 20th century made his last public appearance. Roberto Bolaño's health by then was pretty deteriorated. He was second in the waiting list for a liver transplant that never happened. 2666, his final work, had already been dropped a few months earlier and its section La parte de los crímenes had been left unfinished, as he knew it required far more effort than what his health would allow. Despite this, reports from the gathering in Seville state that he nonetheless was pretty much central to the meeting, being the senior among the twelve writers present. His mood was as usual: joyful, warm, witty. While he had prepared a speech titled Sevilla me mata for the event, he ended up reading Los mitos de Cthulhu instead, for reasons that I haven't yet figured out. All of the present writers agreed (in a way that now might sound as a macabre prelude to what was yet to come but I believe it was pretty far from such an atrocious interpretation) that, while Borges was the Latin-American writer of the early 20th century, Bolaño was in his right way to leave a mark in the post-boom literary movement. They didn't know about 2666 yet. Half of Chile didn't know about him either. I didn't know about him, for that matter. But that's business as usual in literature. Unless you're Vargas Llosa or García Márquez, you need to die first to become someone. 2003, Sevilla. Primer Congreso de Jóvenes Escritores. From left to right and top to bottom: Fernando Iwasaki, Rodrigo Fresán, Ignacio Padilla, Mario Mendoza, Santiago Gamboa, Jorge Franco, Iván Thays, Roberto Bolaño, Edmundo Paz Soldán, Gonzalo Garcés, Jorge Volpi, and Cristina Rivera Garza. Picture by Elena Ramírez. Bolaño died less than three weeks later, on July 15th, in the Vall d'Hebron Hospital in Barcelona, after ten days in a coma. Los mitos de Cthulhu was published by Anagrama in the same year in the posthumous short-story collection El gaucho insufrible. Sevilla me mata was later published in 2004 by the same publishing house in Entre paréntesis, a compilation of essays, columns, speeches, and interviews. There are English translations of both books, by Chris Andrews and Natasha Wimmer, respectively, published by New Directions, the first as The Insufferable Gaucho, in 2010, and the latter as Between Parentheses, in 2011. Go backwards in time to May 2013.